Nuclear Magnetic Resonance (NMR) spectroscopy is one of the most powerful and robust techniques for the study of structures. NMR spectroscopy has been extensively applied in various fields, such as structural chemistry, structural biology, medicinal chemistry, food and environmental analyses, forensic sciences, and biomedical and diagnostic sciences. 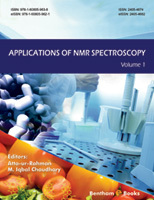 Most of the available books and monographs on NMR spectroscopy cover only a specific topic and it is rare to find a book series which provides in-depth state of the art reviews of applications of NMR spectroscopy in diverse fields. “Applications of NMR Spectroscopy” is an attempt to fulfil this need. The first volume of the series is an excellent compilation of very well written reviews, contributed by several leading practitioners of NMR spectroscopy. The first two reviews deal with the analysis of fats and oils by NMR spectroscopy. Physical and chemical properties, palatability, and shelf life of prepared food, meat and dairy products, and other edibles largely depend on their lipid components. Zhang et al have reviewed the use of Low Field Pulsed NMR Spectroscopy (LFP-NMR) in determining the liquid-solid ratio in various lipids compositions. Solid-liquid ratio is an important parameter which defines various physico-chemical properties of lipids, including particle size distribution in emulsions, fat crystallization, and quality control during food storage and transportation. Interestingly low or ultra-low pulse NMR spectroscopy is increasingly used for a variety of analyses due to its robustness and the availability of cost effective instrumentation. NMR methods have been proven to be robust, reproducible, and accurate, apart from being noninvasive and non-destructive, for the analysis of edible oils and fats. Sherazi and Mahesar have contributed a chapter on the use of NMR spectroscopic methods for the analysis of the quality of edible oils. Emwas et al have presented an excellent review on the potential applications of NMR based metabolomics and metabonomics approaches for the diagnosis of human diseases, such as cancers, cardiovascular and metabolic disorders and neurological diseases. NMR-based metabolomics has several advantages over other techniques, such as identification of new and novel biomarkers in disease conditions, as well as its compatibility with the diverse nature of biological fluids on which metabolomics is conducted. The authors have provided an in depth commentary of various factors that influence the metabolic balance, which can affect the outcomes of the NMR-based metabolomic study. The review by Siniscalco and Antonucci in concerned with the use of NMR based diagnosis of autism and related disorders. Autism spectrum disorders (ASDs) are now regarded as a global health challenge. Our understanding of the ASDs at the molecular level is still very limited due to their complex and heterogeneous nature. Early diagnosis has special merit in controlling the prevalence of ASDs. Proton magnetic resonance spectroscopy (MRS) is a non-invasive technique for the study of chemical and cellular changes that occur during the on-set and progression of ASDs. Early signs of abnormalities at biochemical and cellular levels, related to ASDs, can be successfully monitored by MRS methods. Rieko Ishima has contributed a very well written and thoroughly referenced review on the use of NMR spectroscopy in the study of protein-inhibitor interactions. The understanding of receptorligand interactions is of crucial significance in lead discovery and optimization in the drug discovery process. Ishima has provided an in depth description of various NMR techniques including STD (Saturation Transfer Difference) methods used in the study of protein-inhibitor interactions at molecular and atomic levels. The identification of chiral molecules is a major challenge in structural chemistry, particularly because of the regulatory requirement of pharmaceutical products of high enantiomeric purity that demands such methods. Uccello-Barretta et al have discussed the important applications of NMR spectroscopy in the identification and quantification of chiral drugs and their metabolites. NMR spectroscopy offers several methods which can meet such demands in drug discovery and development as well as in drug quality monitoring. We are very much indebted to the contributors of the various reviews who deserve our special appreciation for their hard work and intellectual inputs in this important field. We would like to thank the entire team of Bentham Science Publishers, especially Mr. Mahmood Alam (Director Bentham Science Publishers), and Ms. Fariya Zulfiqar (Assistant Manager Publications) for the efficient management of the first issue of the book series.